A national referendum proposed by Thai PM Samak Sundaravej has been dismissed by critics as a stalling tactic. Mr Samak announced the plan on Thursday, in an effort to defuse the ongoing political crisis. Anti-government protesters have now been occupying Mr Samak's official headquarters for 11 days, and have vowed not to leave until he resigns. In a sign of continuing tensions, two protesters were injured in a drive-by shooting late on Thursday. 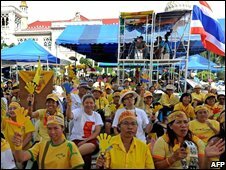 The anti-government protesters - from the People's Alliance for Democracy (PAD) - say Mr Samak is merely a proxy for former Prime Minister Thaksin Shinawatra, who was ousted in a coup in 2006 and is now in exile. Many analysts had assumed Mr Samak would announce his resignation in a radio address on Thursday morning. But instead he insisted he would not resign or bow to those who threatened to bring "anarchy" to Thailand. He then announced his referendum plan, and urged the Senate to endorse the bill as quickly as possible so the vote could take place by early October. Culture Minister Somsak Kietsuranond said the referendum would ask a range of questions including whether the government should resign, whether it should dissolve parliament and what people thought about the ongoing protests. But protesters have ridiculed the plan and have vowed to continue their sit-in at Government House. "The referendum is an attempt by Mr Samak to buy himself some more time in the office," Sondhi Limthongkul, one of the protest leaders, told The Associated Press. Speaker of the Senate Prasobsook Boondech also voiced concerns, saying that organising a referendum would take at least a month. "The problem of the country is immediate and needs to be resolved as quickly as possible," he told reporters. About 100 students marched to Mr Samak's Bangkok home on Thursday evening to demand his resignation. An unidentified gunman on the back of a motorcycle opened fire on the crowd, shooting one student in the leg and another in his arm. Neither was seriously wounded. 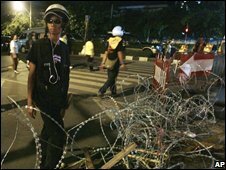 Police in Thailand have told students to refrain from such protests. "The situation is very politically charged. Right now, it's not a good idea to gather," police spokesman Surapol Tuantong told AP. So far the campaign to remove Mr Samak from power has been relatively peaceful, but one man was killed in clashes between pro and anti-government groups on Tuesday, prompting the government to impose emergency rule.